This lesson is about identifying and combining like terms in algebraic expressions. When you are given an algebraic expression, usually you will need to simplify the expression. To do so, first you must learn to identify all the terms in the expression that can be combined. These terms are called 'like terms'. This lesson shows you the process involved in identifying and combining like terms. Know how to identify all the terms in the algebraic expression. 'Like terms' are terms that have exactly same variables. Also, the exponent (i.e. power) of the variables must be the same. The parts of an algebraic expression are called terms. For example, the expression 2 +x +3y has 3 terms. One. Two Three. You can combine terms that have exactly the same variables. This lesson shows you how. Let's say you're asked to simplify x + x + x. To do so, you must able to recognize which of these are like terms. Hence, 'plus x' becomes 'plus apple'. You see that these apples are the same in type and size. So these apples are considered as alike. Now, let's change the apple back to x. You can see now that x+x+x gives 3x. Therefore, all the terms in this expression are like terms. Let's take another example on combining like terms, -x -x -x. Again, imagine that the variable 'x' is an 'apple'. Hence, minus x becomes minus apple. We have a new variable y here. So, let's imagine the variable 'y' is an 'orange'. The each terms in this expression now becomes plus orange, plus apple, plus apple. 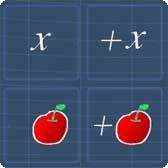 Let's change these 'apples' back to 'x', you now have x + x which gives 2x. Let's change these 'oranges' back to 'y', you now have y + y which gives 2y. So in summary, you can only add or minus terms that are alike. Now, let's take a look at more examples on like terms. Both x, and x square, are not like terms. Why? Imagine that, x is an apple. Then x square must be a bigger apple. Even though, both fruits are apples, the difference in sizes make them not alike. Now, let's take a look at x square, and, x square y power of three. These are not like terms. To understand this, let's take x square to be a big apple. Then, x square and y power of three will be like some kind if fruit mixture. Now, it is obvious that these fruits are not alike. How about, x square y power of three, and two x square y power of three? These terms are like terms. To understand this, let x square y power of three, to be a fruit mixture. Then, two x square y power of three, will be 2 times of the same fruit mixture. Now, you see that, the fruits and sizes are the same, and only the number of fruits are different. So, these fruits are alike. That's all for this lesson on combining like terms. Try out the practice questions to strengthen your understanding. You can start by going through the series of questions on combining like terms or pick your choice of question below.